The demands on IT staff, developers, and managers of business lines grow exponentially. It is always crucial to develop and deploy services and products to remain competitive in the market while maintaining a budget for business-critical infrastructures. By choosing a reliable provider of management and application services such as DedicatedSolutions, companies can focus more on their development efforts, which are necessary to grow their business and innovation, rather than maintain the complete operation. We offer complete products and services portfolio of Managed Services, which is part of a broader offer of companies that allows them to transform your business by hybrid IT and other measures. Due to the increasing IT requirements and the continuing budget and personnel constraints, it has never been more important to find a reliable partner. By working with a provider that support for mission critical IT infrastructure and processes, companies can shorten the time to market and take new initiatives that previously required too many resources. The ability to provide end-to-end IT solutions from assessment and planning to deployment, through to ongoing management and optimization and to provide scalability and expertise at every stage of the life cycles of applications is another aspect of going for the managed services solutions. 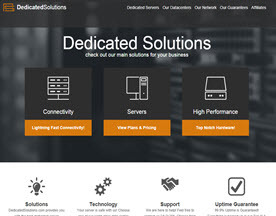 DedicatedSolutions serves Worldwide Data Centers and a robust network and are therefore able to offer business networking and data center integration, which companies cannot devote independently. As a leader, DedicatedSolutions relates in your network and cloud initiatives and work with you based on your budget, the desired features of existing devices and the desired level of control and the outsourcing capability for a solution that suits your best needs. We work with companies of all sizes while offering every company the same performance and range. Moreover, our dedicated account team helps to develop strategies to help you achieve your goals. 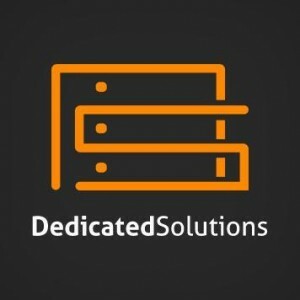 We at DedicatedSolutions know that there is not a single solution to meet all your unique business needs. Our comprehensive platform expertise makes us an ideal partner for your IT transformation. Our diverse solutions meet the specific needs of client applications, and we have a unique hybrid environment that offers cloud agility, while others level, such as databases can remain in a physical infrastructure to ensure that compliance and safety standards are met. Companies that just shift your infrastructure, we offer the opportunity to combine their assets in our data centers and to benefit from our extensive portfolio of managed applications and operating systems. This gives our customers the ability to migrate gradually, rather than to carry out at once. Thus, we offer a smooth transition with minimal downtime. Moreover, we have made significant investments in our hosting service that we guarantee you that your server will be provisioned and up and running within 30 minutes. Since we have multiple carriers at each data center location, you will have unlimited bandwidth with our unlimited solutions. This entry was posted in Data Centers, DedicatedSolutions, Hosting Services, Managed Services and tagged Data Centers, DedicatedSolutions, Managed Services on October 28, 2015 by marketing.